Outstanding and probably most rare of all wooden mortars . . . Tiger (figural) maple with outrageous figure. 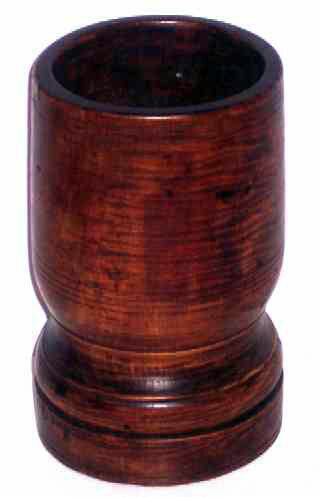 Vase shaped form with turned base. Scribed and incised lines complete the understated decoration. Size is 8" high and 4-14" in diameter at the top. The base is 4-3/4" in diameter. This, an exceptional find, circa 1775-1810.